← Help Tag Tweets from Typhoon Pablo to Support UN Disaster Response! The United Nations Office for the Coordination of Humanitarian Affairs (OCHA) activated the Digital Humanitarian Network (DHN) on December 5th at 3pm Geneva time (9am New York). The activation request? To collect all relevant tweets about Typhoon Pablo posted on December 4th and 5th; identify pictures and videos of damage/flooding shared in those tweets; geo-locate, time-stamp and categorize this content. The UN requested that this database be shared with them by 5am Geneva time the following day. As per DHN protocol, the activation request was reviewed within an hour. The UN was informed that the request had been granted and that the DHN was formally activated at 4pm Geneva. The DHN is composed of several members who form Solution Teams when the network is activated. The purpose of Digital Humanitarians is to support humanitarian organizations in their disaster response efforts around the world. Given the nature of the UN’s request, both the Standby Volunteer Task Force (SBTF) and Humanity Road (HR) joined the Solution Team. HR focused on analyzing all tweets posted December 4th while the SBTF worked on tweets posted December 5th. Over 20,000 tweets were analyzed. As HR will have a blog post describing their efforts shortly (please check here), I will focus on the SBTF. The Task Force first used Geofeedia to identify all relevant pictures/videos that were already geo-tagged by users. About a dozen were identified in this manner. Meanwhile, the SBTF partnered with the Qatar Foundation Computing Research Institute’s (QCRI) Crisis Computing Team to collect all tweets posted on December 5th with the hashtags endorsed by the Philippine Government. QCRI ran algorithms on the dataset to remove (1) all retweets and (2) all tweets without links (URLs). Given the very short turn-around time requested by the UN, the SBTF & QCRI Teams elected to take a two-pronged approach in the hopes that one, at least, would be successful. The first approach used Crowdflower (CF), introduced here. Workers on Crowd-flower were asked to check each Tweet’s URL and determine whether it linked to a picture or video. The purpose was to filter out URLs that linked to news articles. CF workers were also asked to assess whether the tweets (or pictures/videos) provided sufficient geographic information for them to be mapped. This methodology worked for about 2/3 of all the tweets in the database. A review of lessons learned and how to use Crowdflower for disaster response will be posted in the future. The second approach was made possible thanks to a partnership with PyBossa, a free, open-source crowdsourcing and micro-tasking platform. This effort is described here in more detail. While we are still reviewing the results of this approach, we expect that this tool will become the standard for future activations of the Digital Humanitarian Network. I will thus continue working closely with the PyBossa team to set up a standby PyBossa platform ready-for-use at a moment’s notice so that Digital Humanitarians can be fully prepared for the next activation. The vast majority of curated tweets had latitude and longitude coordinates. One SBTF volunteer (“Mapster”) created this map below to plot the data collected. Another Mapster created a similar map, which is available here. The completed database was shared with UN OCHA at 4.55am Geneva time. Our humanitarian colleagues are now in the process of analyzing the data collected and writing up a final report, which they will share with OCHA Philippines today by 5pm Geneva time. Needless to say, we all learned a lot thanks to the deployment of the Digital Humanitarian Network in the Philippines. This was the first time we were activated to carry out a task of this type. We are now actively reviewing our combined efforts with the concerted aim of streamlining our workflows and methodologies to make this type effort far easier and quicker to complete in the future. If you have suggestions and/or technologies that could facilitate this kind of digital humanitarian work, then please do get in touch either by posting your ideas in the comments section below or by sending me an email. Lastly, but definitely most importantly, a big HUGE thanks to everyone who volunteered their time to support the UN’s disaster response efforts in the Philippines at such short notice! We want to publicly recognize everyone who came to the rescue, so here’s a list of volunteers who contributed their time (more to be added!). Without you, there would be no database to share with the UN, no learning, no innovating and no demonstration that digital volunteers can and do make a difference. Thank you for caring. Thank you for daring. 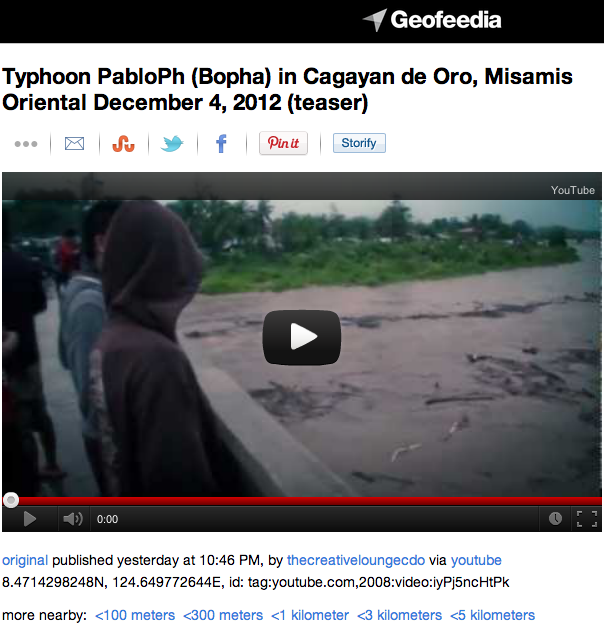 This entry was posted in Crisis Mapping, Crowdsourcing, Humanitarian Technologies, Social Computing, Social Media and tagged analysis, Bopha, Digital, Disaster, Humanitarians, Pablo, Philippines, Pictures, Response, Twitter, video. Bookmark the permalink. The link to the map in “SBTF volunteer (“Mapster”) created this map below to plot the data collected.” is broken, Apparently its not longer availabe by ArcGIS. Is there any way to have it back? Thanks! Thanks for the heads up, David, and apologies for delayed reply, been on a flight most of the day. Just got added a new link. Thanks again!